Home Costs > How Much Does a Helium Tank Cost? How Much Does a Helium Tank Cost? Helium tanks are often purchased for those who need enough helium to fill up a handful of balloons since it’s cheaper than renting and/or buying the balloons. The cost of a tank will depend on the size of the helium tank, the brand and where you purchase it. 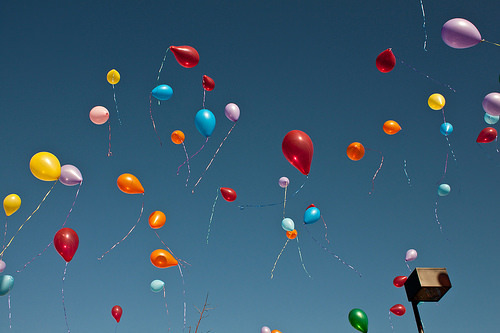 Most helium tanks purchased online are disposable and can fill about 50 to 100 balloons. On average, a disposable tank is going to cost anywhere from $30 to $65. For example, this disposable helium tank created by Worthington Cylinders costs around $35 to $60. This disposable helium tank created by Giant Party Store costs about$40 to $52. There are alternatives available which act like a helium tank, but the balloons generally don’t have as long. For example, the Pumponator will cost $15 to $21. Party City sells a 14.9 cubic foot tank for $55 and an 8.9 cubic foot tank for $45. If you have to pump more than 100 balloons, it may be necessary to rent a helium tank from a local store. Tank rentals are all going to vary depending on the cylinder size and who you’re renting it from. The average rental will cost $55 to $200 for 24 to 48 hours. A 20 cubic foot tank, which can fill about 50 balloons, will cost about $40 to rent, while a 125 cubic foot tank, which can inflate about 350 balloons, will cost around $95 to rent. Tanks purchased at a local party store will often be 8.9 or 14.9 cubic feet. A smaller 8.9 cubic foot tank will fill about 16 17-inch foil balloons, while a 14.9 cubic foot tank will fill 27 17-inch latex balloons. Some kits may include the latex balloons and the ribbon, while others require you purchase it separately. Be sure to read the label to see what’s included. All tanks should be filled when you receive them and won’t have to be filled at a location. These tanks can be purchased from stores, such as Target, Costco, Michael’s, Party City and JoAnn Fabrics. If you want to rent the helium tank, keep in mind that many companies will require a security deposit. This deposit can be anywhere from $100 to $250. This deposit will be returned once you bring the tank back. If you want to have the tank delivered, charges may apply. Delivery charges can range anywhere from $25 to $75. If there is any damage done to the tank, most companies will require that the damages are covered by the renter. More than likely, you won’t get your deposit back. Latex balloons will have to be purchased separately. Depending on the shape and size, each one can cost $1 to $3. Before even using the tank, always be sure to read the warning labels to ensure that you know how to use it properly. Before transporting, make sure that the cap is on tight to make sure it doesn’t leak while traveling. Always move a helium tank with a strapped dolly. Most rental companies will provide you with one. With a helium tank, the average balloon should be able to float for five to eight hours. Most tanks won’t be refillable and can be recycled. Balloon Time shows you how to recycle its tank. Know in advance how many balloons you will need to fill. It may make sense to rent a machine rather than purchase one. Most even recommend just outright purchasing the balloons as long as you’re purchasing less than 30. Purchasing the latex balloons separately may be the best option. For example, many Dollar Tree stores sell latex balloons for $1. If you were to purchase a 14.9 cubic foot tank for $55, you would still need to purchase the balloons separately. For that $55, you would be able to purchase 55 balloons and not have to worry about inflating them at home. One member on WindsorPeak.com said she was able to find a local florist to help fill her balloons for $0.25 to $0.50 each. The same thread said look out for a 40% off Michael’s coupon to save on the helium tank they sell. Using this coupon, you can get a tank for as little as $15. Local Party City had one for $35.